The Oklahoman’s editorial page writers this morning came dangerously close to admitting that quality public education takes an adequate level of funding. They soon came to their senses and remembered that they are supposed to blame teachers, unions, and whiny superintendents for all the bad policy decisions they have made. Anybody who has ever taught students understands the difference that having more instructional materials could make in the quality of instruction. Anybody who has ever held a leadership position has had to make uncomfortable choices between wants and needs. With the decrease in funding to schools over the last few years, that has become a choice between competing sets of needs. The things we want don’t even make it off the tips of our tongues anymore. Matriculated the first group of students who will have high-stakes testing in third grade. All the while, the state superintendent has maintained the posture that each of these reforms can be implemented with minimal additional cost. To make things worse, when the Legislature was about to short the SDE out of $11.5 million in funding, she decided she would just keep that same amount from school districts. When they restored the funding with much vitriol from her own party, she thanked them for their support of putting instructional materials in the classroom. The point here is that public schools have never been tasked with more simultaneous reforms. And while teachers and leaders may not like all the changes, they are committed to making things work. That’s what educators do! Realistically, the state never fully funded all of its expectations four years ago, when per pupil spending peaked in Oklahoma. Now – with more students, more mandates, fewer teachers, and less money – the challenge is even greater. This must be that rigor I keep hearing people talk about. Only it’s for the adults, not the kids. As many people did, I spent the last few days of the legislative session following the action in the House on Twitter where bloggers like Oklahoma Watchdog were giving a blow-by-blow rundown of the rush to sine die. That is why it surprised me when just minutes after the House passed SB 1535 to restore textbook funding to districts, the SDE sent out a communication thanking legislative leaders for the additional funds. In her message, the state superintendent stated that “our goal should be to get dollars to the classroom, where funds can help students.” However, just one day before, she was more than happy to exploit a shortage in funding to take money from the textbook allocation and plug holes in her agency’s budget. So somewhere above getting dollars to the classroom, funding the state agency is a higher priority. If that sounds harsh, just listen to the criticism she got from her own party. Early Friday, District 9 Rep. Marty Quinn stated as others were expressing frustration over the SDE’s intent to divert textbook funding that if it happened with the stopgap they were proposing, that he would vote against every education bill moving forward. District 2 Rep. John Bennett explained that a superintendent from his district had called him to explain that the SDE was keeping one-third of the textbook money. He then reminded the body that last year, the legislature trusted the SDE with a lump sum of funds and that the agency then failed to pay school employees’ flex benefits as legislated (requiring a supplemental appropriation this session). District 61 Rep. Gus Blackwell pointed out that the SDE has a history of ignoring legislative dictates. He followed up by threatening to deplete the agency’s budget if that happens again. District 64 Rep. Ann Coody mentioned that the Senate’s removal of line items in the SDE’s budget the last couple of years has led to unfunded mandates on schools. Members of Superintendent Barresi’s own party were on the floor of the legislature saying that in a little over a year, she has already established a pattern of neglecting their will. Democrats like Joe Dorman, Ed Cannaday, Scott Inman, and Jerry McPeak were also vocal in their frustration over how she has performed. The fact that textbook funding was both restored and protected is huge. This means schools will not have their ability to pay for critical instructional materials depleted any further. It also means that the legislature will likely be more careful in the future when it tells the SDE what to do. It should also be noted that Barresi’s thank you note specifically named “legislative leaders” like Clark Jolley, Jim Halligan, Earl Sears, and Lee Denney for their commitment to seek supplemental funding again early in the next legislative session. Jolley, it should be noted, spent most of yesterday tweeting about his accomplishments as he faces a tough primary challenge from his Tea Party opponent. Sears and Denney notably gave Barresi the benefit of the doubt during floor discussions. Keep this in mind: members of the legislature represent multiple school districts – five on average. Each one has a superintendent. Each has board members elected by the same constituents who put them in their seats. Continued power grabs and blatant abuses of power by the SDE will further alienate Barresi from the people who elected her. She will continue to lose support in her own party as well. I wonder if she’ll heed the multiple warnings she received before adjournment. How much is 11.5 million dollars? It’s roughly a third of the money Oklahoma schools get annually to spend on instructional materials. And it’s the amount that the SDE is now going to withhold from schools to maintain its own budget. Once again, the legislature – which had money to deposit in the rainy day fund – failed to even give flat funding to public education. Schools have more students and more mandates but less money. Instructional materials funding is not just used to buy textbooks. It’s used to buy software, online subscriptions, and class sets of novels as well. If you’re a parent, and you wonder next year why your kid’s books are falling apart or why they have to stay in the classroom, remember this moment. It is the nexus of two bad decisions. First, the legislature missed the opportunity to restore funding to the levels schools received before the recession. Second, the state superintendent capriciously decided that schools need those funds less than her dysfunctional state agency. This week started with the hope that Oklahoma’s Legislature would reject the SDE’s rules for A-F Report Cards for schools. That didn’t happen. They passed a flat budget that combines with inflation and increasing enrollment to guarantee decreases in per pupil funding to school districts. All the while schools have new unfunded mandates in curriculum, professional development, evaluation, and testing. They acted in apathy towards concerns about the real hardships created by the implementation of graduation tests. And now, they may spend more tax money on a special session to cut taxes – to the top income bracket only. That’s what happens when you spend 90 percent of the session legislating social issues in a way that the courts will overturn – and only work at the last minute to try to do the business of the people. What a waste! According to Article V, Section 26 of the Oklahoma Constitution, regular sessions of the Legislature shall be “adjourned sine die not later than five o’clock p.m. on the last Friday in May of each year.” That gives us five days to focus on several unresolved issues affecting public education. While most of the attention will be focused on taxes and budgeting – as it should be – there are other critical issues to which those of us who support the work of professional educators should pay attention. One thing we should watch – and try to influence – is the A-F Report Card rules. 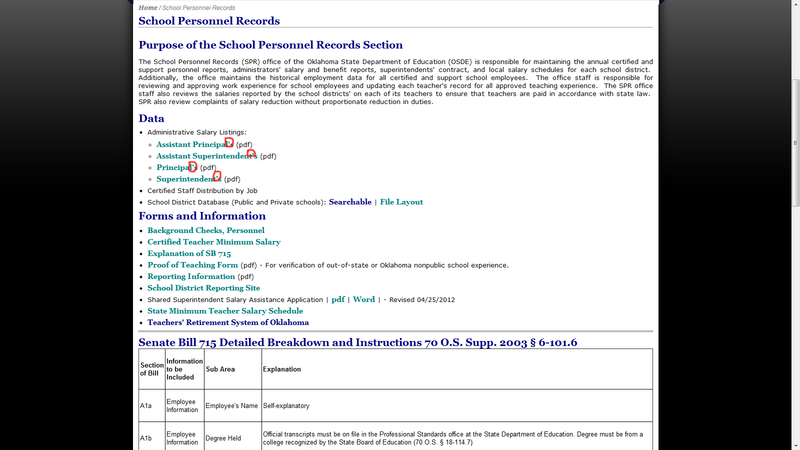 While Governor Fallin and Superintendent Barresi insist this to be settled policy, an increasing number of legislators are listening to the phone calls, letters, and emails they are receiving from educators, parents, and community members. In this article, Superintendent Barresi claims that the resistance to the rules was a last minute “red herring.” Nothing could be further from the truth. It bears repeating that the first draft of the rules were written in seclusion by a small group of high-level SDE staffers with limited teaching experience. Comments to the proposed rules were then made at a spring break hearing that nobody in a decision-making capacity at the SDE attended. They sent tape recorders instead. The State Board of Education – which has been replaced in its entirety by the governor within the last 15 months – was split on approving the rules (which, to the SDE’s credit, had been slightly modified based on the content they received). Passing only 4-2 by the hand-picked board, the rules went to the governor for approval. Before the governor could sign the rules, Representative Mike Shelton filed a resolution in committee to have the rules overturned. The resolution passed out of committee 9-1 and will be heard by the whole house. There is a groundswell of support among legislators to make the SDE go back to the drawing board. This is where we all play a part. The opposition is not a red herring. It’s a legitimate response to the sloppy, opaque manner in which the A-F rules were written. Politicians and the media will be paying a lot of attention to taxes this week. We need to remind them that we still want the A-F rules overturned. We should probably do it daily. Call or email your local House and Senate members. Let them know you appreciate them and would like them to vote against the rules. Because I look for the truth, I keep pretty good track of data. In the three weeks I’ve had this blog, it seems I’ve been getting more than ten times the referrals from Facebook than Twitter. So I started a Facebook page too. I hope to see you there! Apostrophes aren’t hard to understand. I think we teach about those in elementary school. Our State Department of Education needs a refresher course. That will help them to be college and career ready, right?